Our latest addition to our fleet is the sophisticated Range Rover Autobiography Long Wheel Base. The most luxurious 4X4 SUV is perfect for chauffeur driven luxury travel, chauffeur tours, shopping trips around London and Bicester Village, special event chauffeur hire such as Six Nations Rugby and Royal Ascot, Luxury Airport chauffeur Service transfers and for bridal, groom parties for wedding car hire. For chauffeur hire in London, Kent and Essex or further afield our Brand New Range Rover Autobiography is the executive choice for travel for you and your guests. The Range Rover Autobiography will carry up to 4 passengers in safety, comfort and chauffeur driven luxury. The chauffeur driven Range Rover Autobiography will allow you to work, entertain and relax in pure luxury and style. 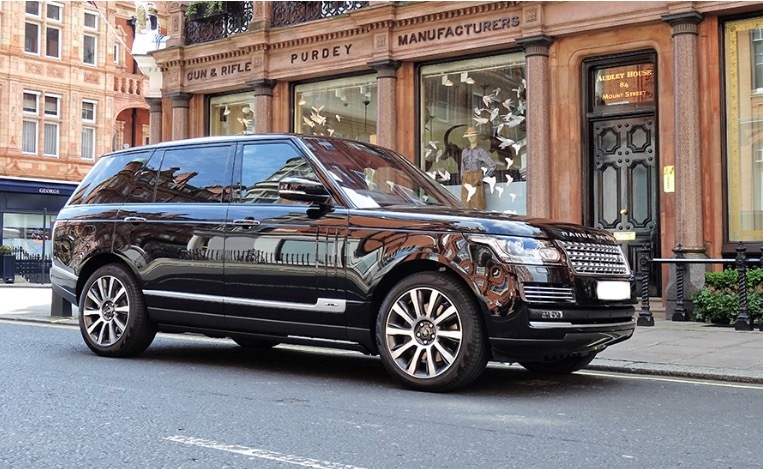 The Range Rover Autobiography in London, Kent and Essex sets a new standard for luxury chauffeur driven 4 x 4’s . Whatever the event you will be delighted with your choice of chauffeur car and the Range Rover offers luxury chauffeur driven travel at its finest. Our latest Range Rover Autobiography chauffeur driven 4 X 4 is the pinnacle of all SUV’S and is the highest specification available. This includes 186 mm of additional legroom in the rear, executive class seating, full cream soft leather interior, rear reclining and heated massage seats, soft closing door aids, rear TV entertainment with 10 inch screens, electric side steps for comfort and ease in getting in and out of the Range Rover and fridge in the rear for chilled drinks at all times. The Range Rover Autobiography is the epitome of luxury and this vehicle has been finely tuned over the decades to stay as the most luxurious 4 x 4 on our road’s today. Experience a new level of style and luxury as the ride quality is excellent as once you are being chauffeur driven in this luxury 4 x4 pot holes and broken roads will be non-existent. This luxury 4 X 4 is very popular with CEO’S, company directors’s TV and Photo shoots as well as Wedding Car Hire and Luxury Airport Transfers in Kent, Essex and London. Combined with the unrivalled highest quality you come to expect from Range Rover the passenger’s will enjoy a luxurious chauffeur driven experience and the day will be a memorable occasion in our Range Rover Autobiography.